What Are Rock Shrimp and How Do You Cook Them? Rock shrimp (Sicyonia brevirostris) have a hard, spiny shell more like some lobsters rather than their shrimp cousins. They also have a texture and flavor like lobster. Rock shrimp get their moniker from their shell which is "hard as a rock." They live and spawn in warm deep waters, 120 to 240 feet below the surface. Until machines were invented to process them, rock shrimp were popular only with avid fishermen and divers because getting to the meat through the hard shell was such a chore. Today, rock shrimp are readily available, both fresh and frozen, head on or off, split and deveined. While rock shrimp do not grow as large as their shrimp cousins, they are sorted and sold in the same way. They are sold by count, meaning the number of shrimp it takes to weigh in at 1 pound. The largest commercially available rock shrimp are 21 to 25 to the pound and are about 2 inches in length (although some have been found measuring up to 6 inches). If you buy whole or headless unpeeled rock shrimp, the easiest way to split the hard shell is to use kitchen shears to cut through the exoskeleton. If you are brave, you can use a heavy, sharp knife. However, the knife can easily slip and cause injury. To boil, add to boiling water, stir, and remove after 35 seconds. Immediately rinse with cold water to stop the cooking process. 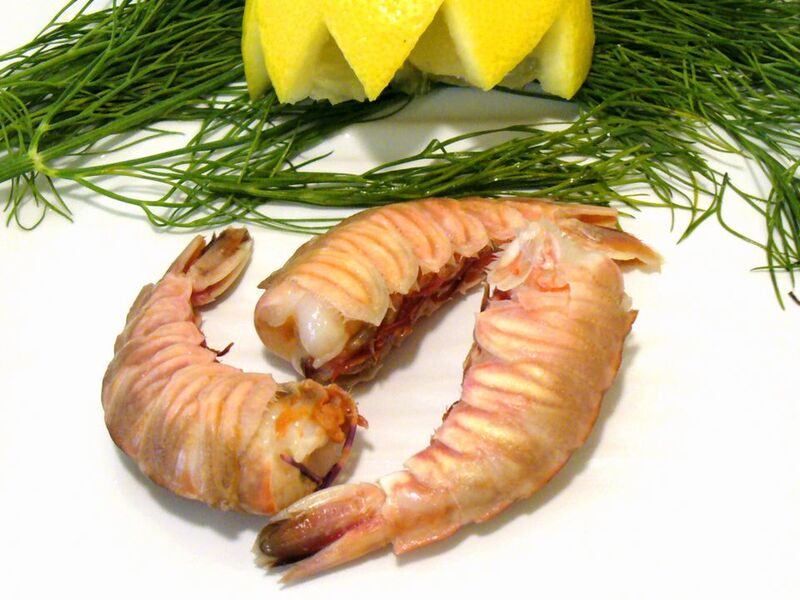 Split rock shrimp can be broiled about 2 minutes until the flesh turns opaque. For sautéeing purposes, the shell is usually removed before cooking. If you overcook it, the flesh becomes tough and chewy.